…wait a sec. The professor is just another version of Patrick?? People assume that time is a strict progression of cause to effect, but *actually* from a non-linear, non-subjective viewpoint – it’s more like a big ball of wibbly wobbly… time-y wimey… stuff. Don’t Blink, or you will miss the details. now why is there a tennis ball in the room…..
SCP 173 did it better, and first. Blink aired June 2007. SCP-173 was posted first in July 2007, and is clearly not ‘first’. Admittedly, none of these are reputable sources, but then again internet history and historiography of random posts on /x/ isn’t exactly known for having a lot of reputable sources in general. Why does this page make you think he’s another version of Patrick? That’s an honest question—various readers seem to be coming to that conclusion, but I’m not seeing it. 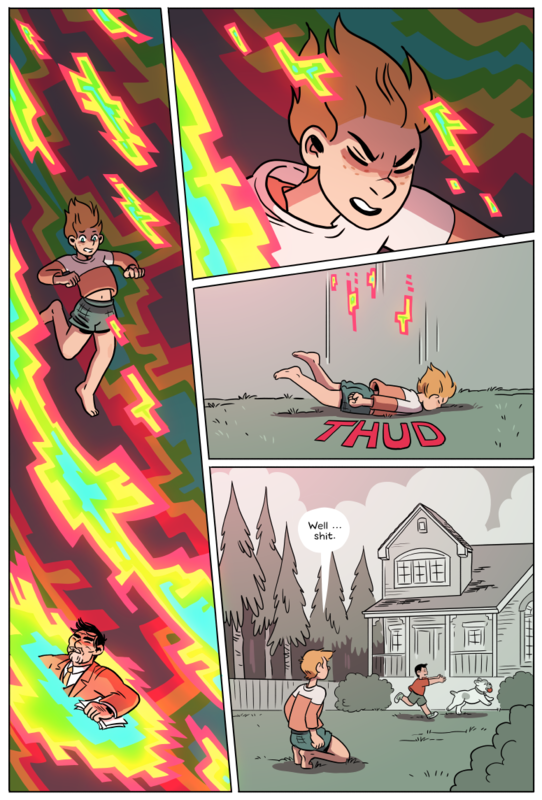 I’m interpreting this page as Alison and Gurwara both falling through a pool of “component,” and Alison ending up in a childhood memory of Patrick’s. The fact is that he seems to be able to alter memories or at least states of thoughts (e.g. the Professor who lost months of his life to time), but is too old to have been affected by the Storm, has a keen interest in Alison, managed to freaking show up in Patrick’s mind of all places, and that Patrick is at least very interested in the prospect of time travel. I missed the part where Patrick is Punjabi though, or are we assuming significant plastic surgery or supernatural equivalent of such? Actually I don’t Patrick’s ethnicity, so in the interest of beanplating could older time travelling Patrick have settled in Ur and gotten a tan? Probably it’s not Patrick though. it’s just someone else with powers that they got a long time before everyone else and they managed to get in Patrick’s head. Imagine if Patrick (in his search for other bio-dynamics & the conspiracy to eliminate them) came across a bio dynamic with the power to shape change (or disguise) others. He could assume the “Gurwara” disuise and create a personality to help talk Alison through the guilt she felt (and he knew she would feel) despite the fact that she would not listen to or trust him. No time travel needed, just a good disguise and the knowledge that no one can really lie to you. Why are you talking about the professor? He hasn’t been in this comic yet. Allison just spontaneously decided to jump in component and now she’s in past memories. //uses her “helpful” face// look again. panel 1, bottom half. see the professor? Nope. There’s no professor. You must be seeing things. 🙂 I guess that looking into component is like looking at clouds. The imagination can make you see all sorts of things. somehow this thread fails to surprise me. Nor me. I swear, people have Gurwara on the brain for some reason. The power of imagination amirite? I approve of puns they are highly underrated. somehow i should have expected a reply like this…. Oh god. We’re going to see the inception of his powers, aren’t we? This is gonna be awful. Awfully awesome and awesomely awful! can i help with the popcorn machine? This isn’t something I actually *believe* but it’s an interesting idea to roll around a bit… Gurwara is Patrick’s *father*. The house is in the woods and nobody else is around. Patrick is growing up a telepath with nobody’s mind to read but Gurwara*. That’s got to mess someone up a bit; not necessarily in a bad way, but it’s going to make his thinking and values very different from other people’s. * And a dog. That bears some thinking on as well. I knew it! Patrick flashback time! Oh god, this is going to be really sad, isn’t it? Only when he was the dog. 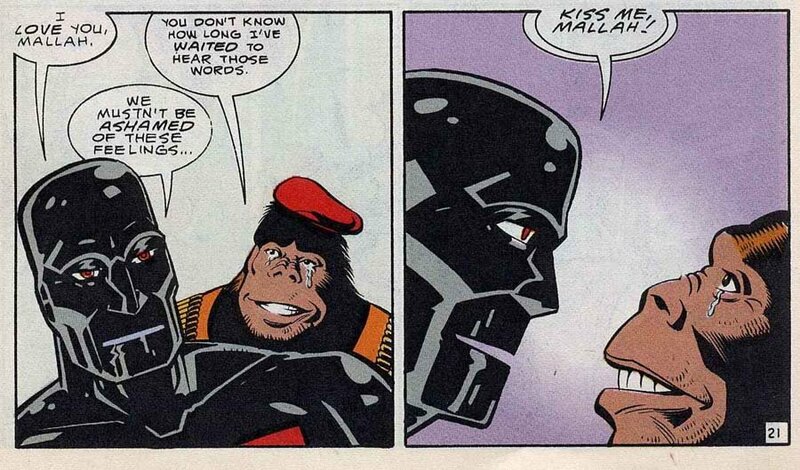 Monsieur Mallah and the Brain, ladies and gentlemen. 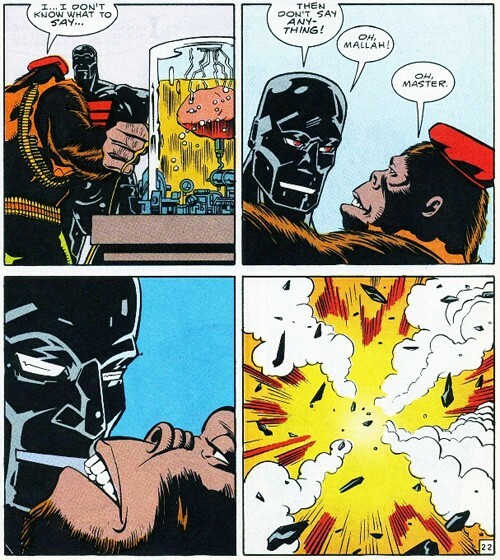 By way of reminder of what can happen in comics. My favorite LGBTQAI couple in comics! From the creator who brought you Danny the Street, everyone. Oh Arkone. you left out the best part! That landing’s going to cost her points from the Russian judge! Yeah, but they pitch the high score and the low score…. Anyone else old enough to remember black light posters from the 70’s? Am I the only one getting this vibe? At this point it’s still possible that we’re seeing a non-interactive memory. Alison could at least be so polite as to make sure before she runs around children with her potty mouth. He is chasing an important dog. When it’s a memory made visible. So, now we see that this series – like all literature, really – is basically a reimagining of The Wizard of Oz. Alison is Dorothy, obviously, and she’s just fallen from the sky and begun her quest to find the Wizard, Gurwara, and get back home. Except in this reimagining, Patrick is the Scarecrow looking for his brain and the Tin Woodman looking for his heart and the Cowardly Lion who’s looking for courage. Each of his manifestations has pinned their hopes on Alison, and they just need to learn that they had everything they needed all along so Alison can metaphorically click her heels together and get back home. But he did kind of hold the line while waiting for Allison. And the allegory about the gold standard has always been there, of course. If you want politics in the series, the second novel is a more rewarding read than reading between the lines of the first. Wait, are you claiming Strong Female Protagonist *isn’t* an extended allegory about the gold standard? What, do you think I was just making a dumb joke? He was making a dumb joke. I think i got about 5 books in before i couldn’t take it anymore. then i got calgon. I believe Patchwork Girl is book 6 or 7. If at all possible, yes. Which has led me to read some really sub-par novels for completeness’ sake. This is either Gurwara’s childhood or Patrick’s. Gurwara is an older Patrick, maybe? Patrick can eat people’s entire minds, and he ate Gurwara’s. Well that’s nothing special; anybody can eat someone’s entire mind, if they have the stomach for it. That was an initial theory for the identity of Anima, but it was disproved. The evidence so far does not suggest that he has active mind-clones of anyone running around loose inside his head; they might be active but are contained. (Of course, like Anima, one might have gotten loose, but the event that allowed her to get loose was before Al met Gurwara, so the mind-clone couldn’t know about the events of the prior chapter if that’s what happened.) It is known that he has a mental defense mechanism against other psychics, so a psychic interloper taking advantage of the chaos would also seem likely. Nevertheless, I’m sticking by my initial wild mass guessing. More narratively interesting, as far as I’m concerned. Cool to see how the layout of the page is set up so that we get a direct comparison between Gurawara and the kid. The way they are side-by-side and uses the same clothes color makes me think they’re the same person but in different times. Is that the same clothing color? I’m partly color-blind so I can’t be sure, but it looks pretty different to me. And the color of Gurwara’s suit jacket on the previous page also doesn’t look to me like the color of the kid’s shirt. To me, seeing Gurwara and the kid juxtaposed makes me think they *don’t* look like each other, except sorta kinda in the hair. They seem to have different skin tones. Few things are more terrifying to me than a perfectly maintained garden fence. I am utterly unable to relate to or predict the actions of anyone who can prioritise the upkeep. It’s unfortunate, but Patrick’s first dog was a heavy drinker. Things often got heated when he was in the doghouse. The hand with the red fingernail polish and the copious amounts of blood suggests this memory is possibly not going to end well. Gurwara sitting right there is cracking me up. My guess is he’s Patrick’s ‘evil mentor.’ When he was much younger and inexperienced, Gurwara saw kid Patrick’s power as something that made a benevolent dictator or philosopher king feasible. Then Menace happened and his views drastically altered. Haven’t reread archives for a while, but seeing the current professor in Alison’s mind would contribute a lot to a breakdown. I’d thought about this, but we don’t have enough canon evidence to support it. It seems more likely to me that Menace is the result of Arjun’s interference / mentoring – the question is, was Arjun pushing him towards the Menace persona or was Arjun leading Patrick away from the Menace persona? As pure speculation goes, though, I am so on board with this. but is any of it love pudding? Oh, another thing I wanted to mention: the washed up colors could (and most likely do) indicate old and fading memories save for specific elements (the shirt, the ball in the doggo’s mouth) but it again could lend credence to the theory that Patrick is colorblind. Evidently it’s pretty clear he can see colors now considering the paintings, and it’s not the theory I like best, but as it is all in greys and tentative reds, maybe it really is that he was colorblind before his powers could lend him the abled vision of other people. Where does the colourblind!Patrick theory come from? First time Alison opened the door to Patrick’s mind and gazed upon a city of greys. Well, that just Normans my Rockwell. Is this the profesor or Patrick’s memory? Could the professor have been Patrick’s dad? They are visually similar but still obviously distinct. I think that kid is smolPatrick from before he had telepathy. Bit sloppy on the landing there, Alison! Must say I’m a bit disconcerted by people wanting to literally whitewash Gurwara into really being Patrick. …so that’s what the avatars are desesperatly trying to keep cut off the main consciousness ? That… doesn’t bode well. At this point, I’m starting to wonder if Gurwara is a literal trickster god. Is that Patrick’s conception of him, or is he, the actual him, in Patrick’s mind to lead Alison to where he wants her to be, unrelated to whether Patrick even knows that he exists? Oh great, now we have to wonder if Gurwara can alter Patrick’s memories by doing whatever he did. If so, I’d take anything we see in this memory with fistfuls of salt. …. Is the professor a projected older version of Patrick?